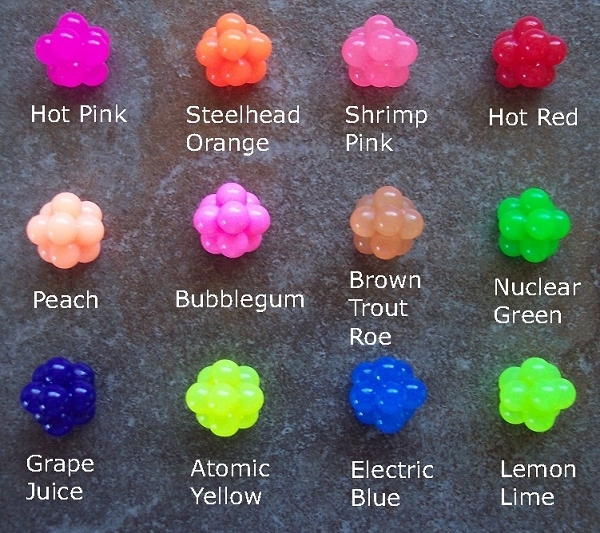 Steelhead / Salmon Egg Clusters - Buy in BULK and SAVE! These artificial salmon egg clusters look, feel and smell like natural bait. They're super soft, floating baits that are LOADED with our secret blend of scents (Shrimp, Roe and other natural ingredients) that Salmon and Steelhead just can't say no to. 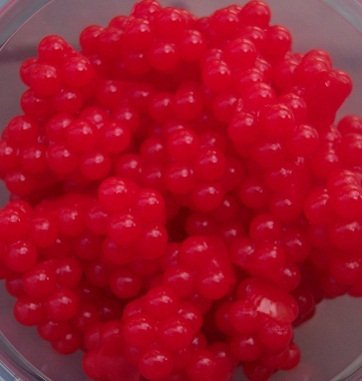 Unlike beads or other hard egg imitations, these baits are super soft. 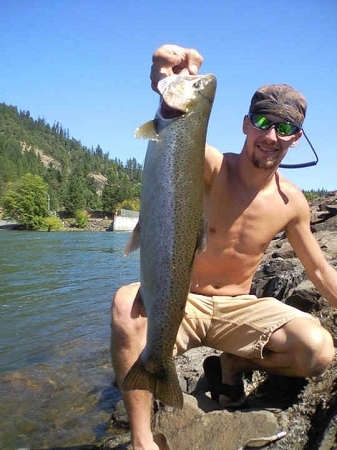 When salmon and steelhead bite they hold on, allowing you to get a solid hook set. These medium egg clusters are about the size of a penny and are the preferred bait for moderate flowing rivers. These work great for both summer and winter steelhead, salmon and BIG trout. A Guide Pack is a bulk pack of egg clusters (5 regular packs in one) at a discounted price. Guide Packs are sold as one color and one size per pack. The medium's come with 60 egg clusters per pack. These bulk packs are very popular for both fishing guides and weekend warriors alike. If you fish a lot and you know what size and color bait you like best, a guide pack may be the best choice for you. These baits are hand made in our own facility in Grants Pass, OR. We don't buy from some other source, we make them in house and all raw materials are 100% Made in the USA. Every detail of these baits has been carefully thought out. From size, to color to scent these baits are tailor made for Salmon and Steelhead fisherman. Our scent infusing process truly sets these baits apart from any other artificial bait on the market giving you an effective, easy to use, mess free and readily available alternative to natural roe. I've been tying up leaders with the medium shrimp pink egg clusters, adding white bling and shrimp pink yarn w great results! These are by far the best artificial eggs I've ever seen.... Great product guys!!! I purchased 7 guide packs of the medium salmon egg clusters, and 2 packs of the 3" worms, you never know which color, or version, the fish will choose. The only negative comment I have is that everyone one on the river asks me if they can have a few! These egg sacs actually out produce natural egg sacs, and the best part is, they can be used on catch and release only waters, the unscented version. My buddies also wrap them in blue, pink, orange, or yellow netting, making them that much more deadly. Believe me, if you do not have these in your fishing vest or pouch, you are missing the opportunity to catch and land the fish of a lifetime. Q: Looking for egg cluster to use as lure body for salmon. Need orange cluster about size of dime. Will your cluster hold up to abuse by several fish with falling apart? We've had several guys use our mini egg clusters and the medium size as spinner bodies over the years and they seem to like them. They are durable but I have never used them as a spinner body so I can't give a definitive answer as to how long or how many fish they'll handle. The general rule with any artificial bait is that fishing from a boat your baits last longer because you can chase fish and your typically not needing to horse them in. Guys on the bank with this technique would definitely go through a lot more baits, especially with kings because your limited in how far you can walk down river before you need to put the heat on them and horse them back to your position. In the bank situation I wouldn't be surprised if you got one or 2 fish on those baits, but I could be wrong. The major benefit is that these are soft, scented and hold scent. Sorry for the long reply, it's just tough to give a simple answer on this one. Feel free to ask a follow up question or as always, you can always give us a call, we're happy to help 541-508-3474.